Labels: block trades, NYSE TICK, professional traders. I'm done early today, leaving a little frustrated but with a positive P/L and a positve P/L for the week. I bought ER2 3 ticks away from the low as noted in my trade execution report, however, I trailed the trade with a stop that was too close, which is something I need to work on. I should have instead used a 0.7pt stop with a profit target placed at the POC or VWAP. Instead of taking only a few trades, I scalped many trades today using the NYSE TICK extremes as guidance while also making sure professional traders were making trades during the same time at these tick extremes. Although I bought the LOD, most of my money made was by scalping during the mid-day by buying tick lows and fading tick highs. 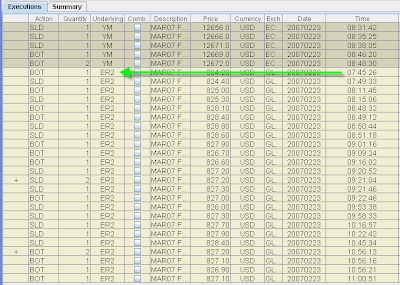 You will notice I lost money on YM while making 3x as much in profit on ER2. This is because I normally trade YM when I have less confidence in the trade setup, but I still want to take the trade, so I enter the trade with less risk by trading YM. Most of my trades today were made around the #'s noted on the chart. 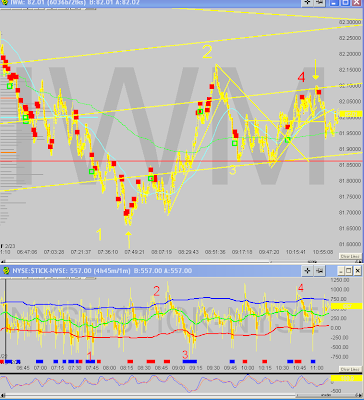 During the day I mainly watch ER2 and IWM on a 2 tick chart with block trades noted by red and green blocks while also closely following NYSE TICK. I also watch the key sectors moving the market,(today it was XLF, SMH and XLE). I also watch NQ, YM, ES, NYA index, the 5 year note, and the market internals like VIX and A/D issues and up/down volume for the 3 exhanges. I don't watch the TRIN because I have never seen any edge in using it based on my style of trading. This weekend I plan on analyzing my charts for patterns in the LOD and HOD with respect to block trades, NYSE TICK, and volume based market profile.